Barcode scanner app. 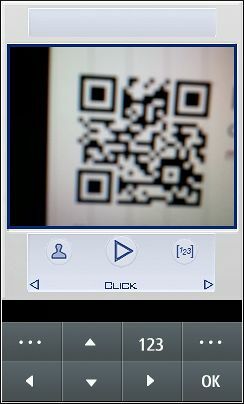 Uses the phone camera to scan and decode Data Matrix, QR codes, Aztec Codes, EAN, UPC, and Code 128 barcodes. If the code contains a URL, NeoReader lets you open that URL in the phone’s browser. The app “NeoReader” (252 KB) is ready to download or send to your phone as filename: “neoreader”. If the app can’t access the phone’s camera it takes you to a screen that lets you enter the numeric code that’s printed under some barcodes. The jar is the executable. The jad is small text file that contains information about the app (size, required java version, permissions the app requires, etc). If the app is signed the signature is in the jad. For touchscreen phones the jad may contain commands that tell the phone to hide the virtual keyboard. Some phones can install jars directly but if you are downloading to a PC for transfer to the phone, the “right” way is to download both the jad and jar, copy them both to the same folder on the phone’s memory card and then open the jad with the phone’s file manager.